It's at times like this that I'm grateful that I try to instagram my food posts close to when I do the tastings as I visited Carbone on the second day it opened and I had completely forgotten to do a review of it until just now when I've had a bit too many yummy meals in between and it's been almost a month since we went. I do recall however, the vibe of the resto being very old school (music playlist comprises Calendar Girl, Hey Mr Postman, Only You etc). Sadly enough, I somehow know all the songs leading my friend to comment that I'm secretly a super old lady which I don't deny. 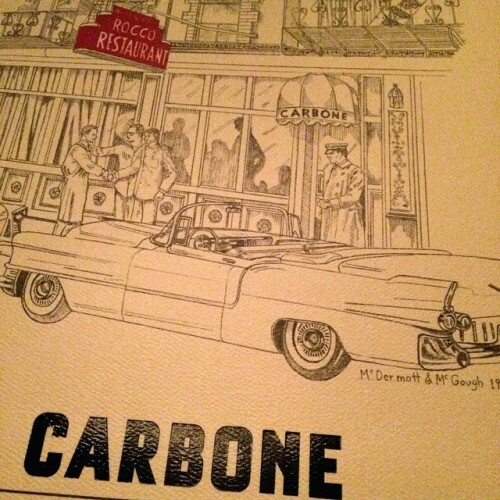 Here at the restaurant, it's the staff (namely Louie Carbone, Mario's cousin) that makes it work rather than the food itself which was not bad but tend to be on the pricey side. Each of the dishes are quite large though and are totally shareable. 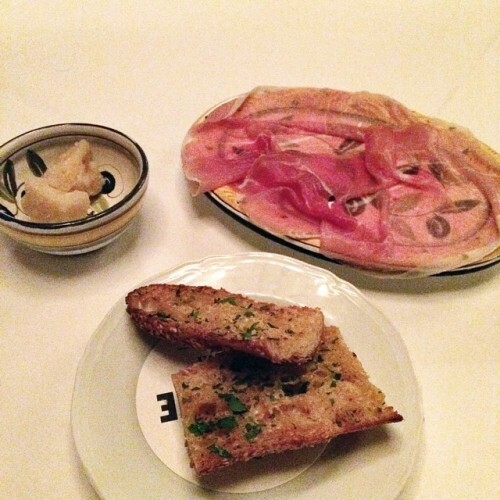 We started with the US prosciutto, 24 month aged Parmesan with super buttery garlic bread. 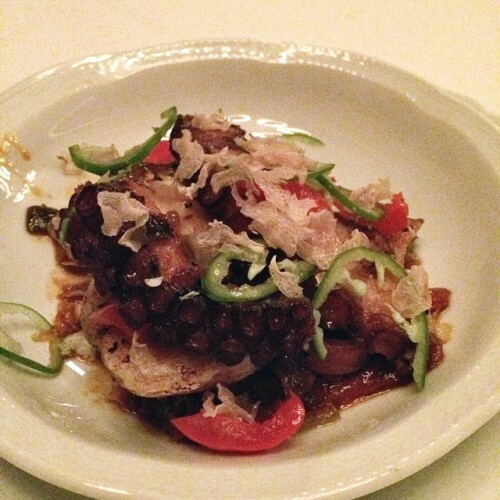 Moved on to Octopus pizzaiolo which was nicely charred and tender with a spicy kick. 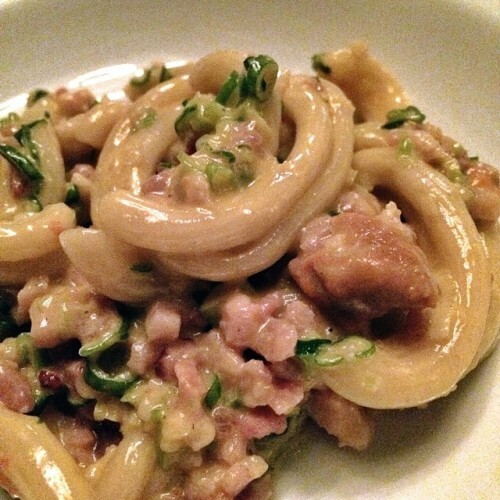 Then we had the Fusilli Vito which was highly recommended but we felt there was a tad too much pancetta in the dish and the saltiness masked the uni taste. There was also a ton of spring onion which further robbed the uni flavour. Pity. Double lamb chops with potato Louie on the side. Louie described the potatoes as having “lots and lots and lots of duck fat and it’s on me if you don’t like it. Also I served it to vegetarians and they said it was the best veggies they’ve ever had.” At our looks of horror, he went “just kidding”. 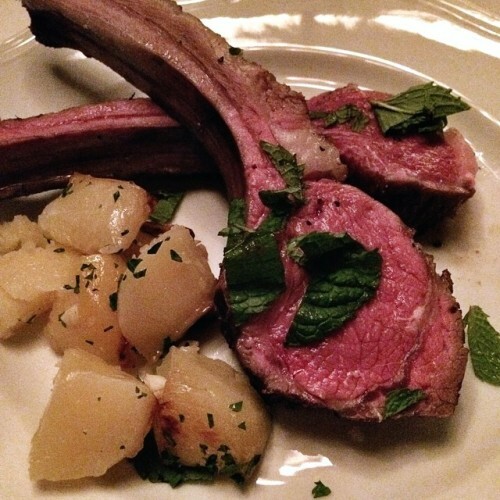 The potatoes did lived up to the hype and the lamb chops (from Colorado) were super tender. In fact, even though we were approaching food coma, we kept nibbling away at the potatoes. We finished the meal off with a banana flambé for us served with ice cream and rum soaked banana bread and a couple glases of grappa. 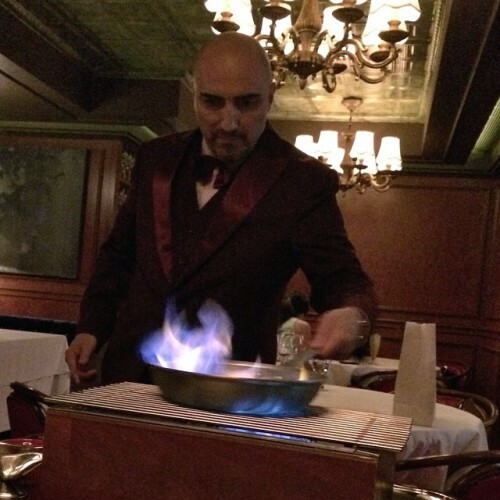 The lovely thing about Carbone is that they pride themselves on table side service and making a show of things (harking back to the older days in line with the music and decor choices.) As mentioned previously, Louie took great care of us and totally gives the restaurant its vibe. Judging by the instagram feeds of my fellow foodie friends, they seem to agree.